We stumbled across these unusual cloud-pruned or pom-pom topiary Olive trees on a buying trip to a small grower and persuaded him to let us have a few to offer our customers. He usually pots them up into much bigger pots, grows them on into huge specimens, and then sells them for hundreds of pounds - so maybe the glass of wine at lunch persuaded him! Known as 'Niwaki', cloud pruning is a Japanese method of training trees and shrubs into shapes resembling clouds and our grower has done the hard work so you don't have to - selecting the stronger side branches and carefully pruning them into shape. You can let your imagination take over now, and let them grow as big or little as you wish. We’re more than happy to pass this amazing opportunity onto you and give you the change to grow one of these splendid topiary specimens. Perfect as centrepiece specimens in big pots, or in hot, sunny spots of the garden, they are very hardy and easy-care. Prune to shape 3-4 times a year with secateurs or shears, feed with specialist olive feed, and enjoy for years and years. You are unlikely to get any olive fruit by keeping them as cloud-pruned specimens, but then they’re such an outstanding evergreen tree anyway that it’s not a problem! Stocks are very limited, and we may not have any more in future seasons, so order now to avoid disappointment. 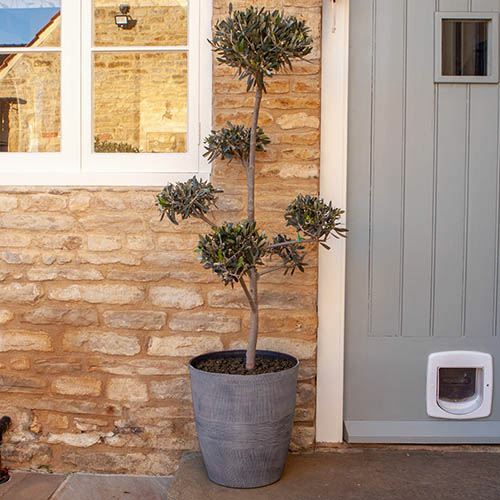 Supplied as a pom-pom standard olive tree 1.2-1.4m tall (including the pot), min 5 'clouds', for planting out. Supplied in 20cm nursery pot . Supplied as a pom pom standard olive tree 1.2-1.4M tall, min 5 'clouds', for planting out. Supplied in 20cm nursery pot .